...Stonewalls were first built to exclude, not enclose, animals from public places, such as cemeteries and churchyards. ...The hills and woods of Vermont abound with the remnants of old stone walls, the animal enclosures and runs, and stone foundations of the homes, barns, sugar houses, that remind us of a past farming culture that moved west during the mid-1800’s, seeking an easier working environment. ...With the invention of barbed wire in the 1870’s, building stone walls on farmsteads became a thing of the past. ...Over 10,000 years ago, as the glacier melted and receded from Long Island and Cape Cod north through New England, fieldstone and a multitude of other rocky material was indiscriminately left behind, creating the geology of the land as we know it today. ... The natural balance of a water garden is a cycle that helps to keep ponds healthy and clean - fish eating plants and algae then producing waste that is converted to nitrogen by beneficial bacteria. Nitrogen enhances plant growth, providing a healthy food source for the fish as the cycle starts over again. ... Water lilies, by far the most popular of pond plants, provide not only lovely blooms, so perfect they are almost unreal, but also help keep ponds cool and clean with their large, heart-shaped lily pads that spread widely over the water. A water garden is a magical place...a respite from a busy world, a magical wonderland for children, a relaxing getaway for entertaining family and friends. Just the calming effect of the splashing waterfall and the bubbling stream would be enough, but there’s more—flowering cannas, hibiscus and water lilies. And water creatures you’ll grow to love—frogs perched on lily pads and colorful fish swimming toward you hoping for a bite to eat. All of this in your own backyard paradise, a living sanctuary where nature abounds. Experience the water garden lifestyle—an exciting trend in healthy living. 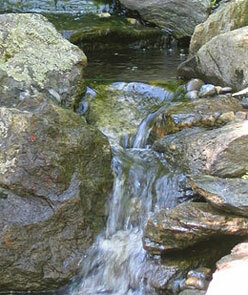 Streams add natural sounds and beauty to a pond and can be added to any installation for about $100 per foot of stream.